London, The Arab Weekly – “We are humans. Where’s the hu­manity? Where’s the world?” asked Ahmed Satuf, a Syrian refugee in Greece. Satuf was speaking to an Arab TV station when he told of fleeing violence in Idlib only to become trapped in Greece. Like tens of thousands of others, he was trying to make his way to Germany. They will have to traverse large parts of southern Europe — on foot, on bus­es and trains, some even on bikes — before reaching their final desti­nations. All of this after making the treach­erous crossing across the Mediter­ranean in overcrowded dinghies, a journey that has claimed more than 2,000 lives in 2015. 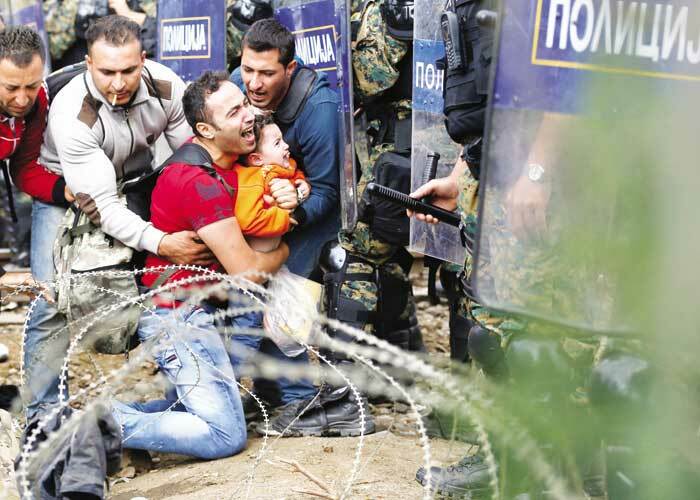 The refugees are desperate, with the Middle East arguably witness­ing its worse unrest and violence in recent history. The Islamic State (ISIS) is expanding in Iraq, Syria and Libya. There have been terrorist at­tacks in Egypt, Saudi Arabia, Kuwait and elsewhere by ISIS affiliates. The violence shows no sign of abating, forcing tens of thousands to flee to neighbouring countries and beyond. Europe is seen as the “Promised Land”. Syrians making the dangerous journey — passing through Greece, Macedonia and Serbia — hope to reach Hungary, a member of the European Union’s bor­derless Schengen zone. Syr­ians, mostly middle class and well-provisioned, are trying to make the difficult journey as quickly, and safely, as possible, utilising smartphones and so­cial media. “I have a map,” one Syr­ian refugee, a teacher, told the New York Times, tapping his head. “It is here — and on Google Maps.” They keep in touch with friends and relatives — either back in Syria or those already in Germany or elsewhere — through mobile messaging app WhatsApp. This is also how they communicate with smugglers. After reaching Hungary, it is easier for refugees to reach western and northern Europe. Hungary, however, does not ap­pear pleased at being the gateway to Schengen and has sped up construc­tion of a 4-metre-high fence across its 173-kilometre border with Serbia. Approximately 140,000 migrants have reached Hungary in 2015, more than three times as many as in 2014. Germany is the final destination for many migrants, not just Syrians. Germany received a record 83,000 migrants in July, with that record expected to be broken by August’s figures. “My friends who have already reached Germany told me that eve­ryone respects you. If you go to your job, learn the language and be a good person, then you will have a very good life there,” one Syrian refugee, who declined to give his name, told Britain’s the Independent. Despite record asylum applica­tions, Germany is doing what it can to meet the demand from Syrian refugees. Germany has reportedly stopped enforcing an EU rule under which Syrians fleeing the civil war face deportation and has called for a major overhaul of the EU’s asylum system. According to the Dublin regula­tion, migrants seeking asylum must do so in the first European state they enter. For Syrians, this is often Greece, which itself is in the grip of a debilitating financial crisis.